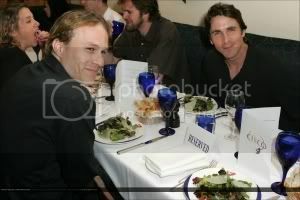 The fans over at www.christian-bale.org have posted these photos of The Dark Knight co-stars Christian Bale and Heath Ledger — Batman and The Joker! — sharing dinner together at the New York City premiere of Bale’s upcoming film, Rescue Dawn. Click the link for more photos, and then click the individual photos for larger versions. In the movie, of course, they’ll look like this and this. Can’t wait. The Dark Knight debuts in a theater near you on July 18, 2008! Christian Bale speaks out about Batman!